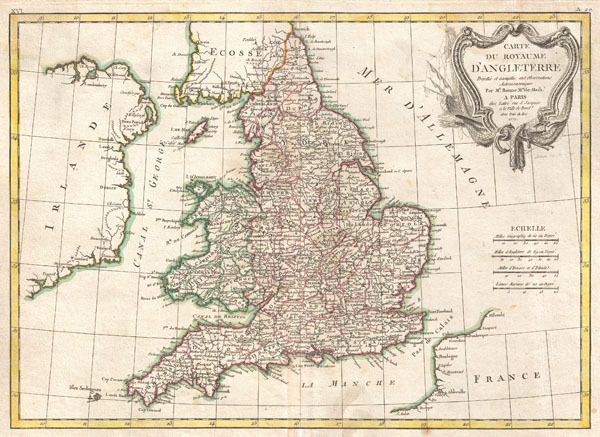 A beautiful example of Rigobert Bonne's 1771 decorative map of England and Wales. Covers all of England and Wales as well as parts of adjacent Scotland, Ireland and France. Divided by county. A decorative baroque title cartouche appears in the upper right quadrant. Drawn by R. Bonne in 1771 for issue as plate no. 36 in Jean Lattre's 1776 issue of the Atlas Moderne. Very good condition. Original centerfold exhibits light toning. Extremely minor soiling bottom center. Blank on verso. Minor water stain upper left quadrant. Rumsey 2612.040. Phillips (Atlases) 664. National Maritime Museum, 215. British Libarary (World), col. 384-385 (1762-1785 eds. ).